Mrs. Evans has made a career out of being an “ex-evangelical.” (sort of like Bart Ehrman, except he’s a bit more honest than her). She mocks the word of God for profit and once again insists that the Bible’s authors were blasphemous liars and that the text did not turn out as God wanted it to. After all, if the Holy Spirit had been involved then she wouldn’t have to edit it. The world loves her messages because she poses as a Christian who tells them just what they want to hear, namely that the Bible is a silly book that they do not need to read or take seriously. And of course she fights for legalized abortion to the child’s 1st breath (and without anesthetic, of course, because compassion), is wildly pro-LGBTQX, etc. 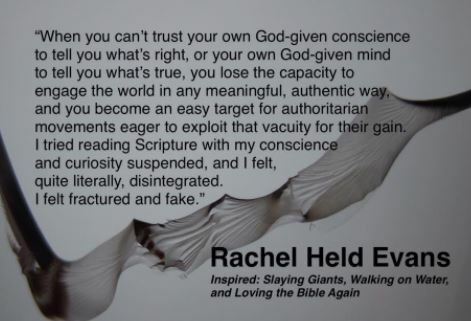 Her primary self-description is “doubt-filled believer,” but she has no doubts that her conscience trumps (heh) the Bible and that Jesus agrees with all of her Leftist politics. This is the “Christian” who demands that her conscience be the guide as to what is really from God. Here’s a sample from her latest book. Got that? Your conscience is God, and it sits in judgment of the Bible. What could go wrong? It is classic “Christian” Left rationalizing and creating a god in her own image. The real Jesus doesn’t fit her sensibilities, so He must be wrong. Uh, sure. Her followers will think it is so poetic blah blah blah but it is the same old rebellion. She can’t possibly see how God just might understand something better than her. Isaiah 55:8–9 For my thoughts are not your thoughts, neither are your ways my ways, declares the Lord. For as the heavens are higher than the earth, so are my ways higher than your ways and my thoughts than your thoughts. It [the Bible] fails massively at getting to the point. That is spoken like a non-Christian. Here’s a simple example: The Bible teaches over 100 times that Jesus is the only way to salvation (it isn’t just John 14:6, though that would be enough). What could be more clear? But a spiritually blind wolf like Evans can’t see that — and obviously doesn’t believe it. Even two out of three types of pro–gay theologians* concede those points, yet the “doubt-filled” Evans has zero doubts about affirming every sexual perversion in the LTBTQX spectrum. And note how she insists that her sitting in judgment of the Bible is what it truly prescribes, as if we should all trust our consciences. Non-Christian Mrs. Evans quotes non-Christian Thomas Paine to attack the Bible. Seems about right. No, wait, at least Paine was honest about his beliefs. I’d take Richard Dawkins over Evans any day – at least you know where he really stands. This isn’t a nuanced debate on a meaning of a Hebrew word. We all agree that the text says God said to clear out the Promised Land, among other things. But Evans’ sleight of hand is to conflate her conscientious objections with the fact that there are some legitimate debates on some Bible passages. But the net of it is that she claims those are blasphemous lies that don’t belong in the text. And we aren’t talking about a couple verses, but literally many hundreds of verses tied to the prediction, execution and references back to the taking of the Promised Land. So once again Mrs. Evans claims that the Holy Spirit did not inspire the writings and that the human authors were blasphemous liars. That’s her prerogative. We even have a precise theological term for people like her: Non-Christian. Jesus affirmed the Old Testament and authorized the New Testament. You can agree with him or with Mrs. Evans and the “Christian” Left. Choose carefully. Mrs. Evans et al are such transparent wolves. They must have gotten too warm, because they took off the sheep’s clothing long ago. Their followers are getting what they deserve. At least that’s why my God-given conscience tells me, so I must be right! *Pro-gay theology tends to fall into one of three categories. They are all wrong, but for varying reasons. Sometimes they overlap categories. RHE can’t do enough to show her hatred for God and Christianity. If she claims that the Holy Spirit did not inspire the writers of the Bible, then she has no claim on the Holy Spirit inspiring her. If what she says is true, then why listen to her or buy her book? Well said! Consistency is not her strong suit. Conscience-guided reading is Christ-centered reading, as this was the way Jesus taught us to read the Scriptures:. If we read w/out the help of the Holy Spirit working through our conscience in prayer, we are apt to claim God blesses genocide or slavery or infanticide (Psalms 137:9). The Binding of Isaac teaches this lesson also. God appears to call for an atrocity. Then it turns out this was not really what God wanted Abraham to do. Reading with Christ’s Spirit assisting us in prayer, we would never think God wanted us to kill our child (or harm any other soul) and we ask God for further guidance. That’s “Christian” Left gibberish, and a reason that the “Christian” Left Bible is so tiny — https://1eternitymatters.wordpress.com/2014/01/21/the-tiny-bible-of-the-theological-left-read-it-all-in-5-minutes/. You cannot claim to take the Bible seriously if you deny that God called for the clearing out of the Promised Land (just one example!). Scan the Bible and see what I mean. Oh, and God deals with his own as well: Jude 5 Now I want to remind you, although you once fully knew it, that Jesus, who saved a people out of the land of Egypt, afterward destroyed those who did not believe. I hope you repent and believer before it is too late. Christians on the Left are, despite differences, fellow believers, your brothers and sisters in Christ, btw. Lose the hate? That’s a lot of errors and fallacies in one comment. You beg the question by assuming that you are fellow believers, when the subject of the debate is whether you are. You also argue by assertion in saying we hate. The truth sounds like hate to those that hate the truth. I love you enough to tell you the truth: Your religious beliefs are wrong. LEFTIST “Christians” seem to worship a God and Christ of their own making, just like the cults. They call themselves Christians, but the Christ they worship can’t save.